Egypt's navy raised the national flag Wednesday aboard a Type-209/1400 submarine newly-arrived from Germany at a ceremony in Alexandria, celebrating the country's latest arms addition intended to protect regional waters and bolster national security. The new submarine, manufactured by German company ThyssenKrupp Marine Systems, officially joined the navy's fleet Wednesday. Egypt first celebrated its handover in Germany in December. On its journey to Alexandria, the submarine sailed from the German city of Kiel at the end of March and passed through several waterways including Kiel Canal, the Elbe River and the Strait of Gibraltar before reaching Alexandria's Ras El-Tin naval base. The submarine has a range of 11,000 nautical miles and a top speed of 21.5 knots. It is equipped to launch missiles and torpedoes. 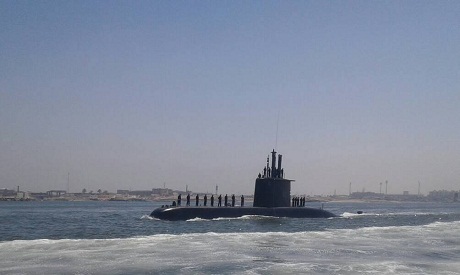 The Egyptian navy undertook exercises using the submarine on 18 April, ensuring its readiness to join the fleet. During the celebration, navy Chief of Staff Ahmed Khaled said the attack submarine was one of the most advanced of its kind, and would help the country combat ongoing and future security challenges. "The armed forces have adopted a comprehensive strategy to develop the navy and its fighting abilities, and to provide the necessary infrastructure," Khaled said.